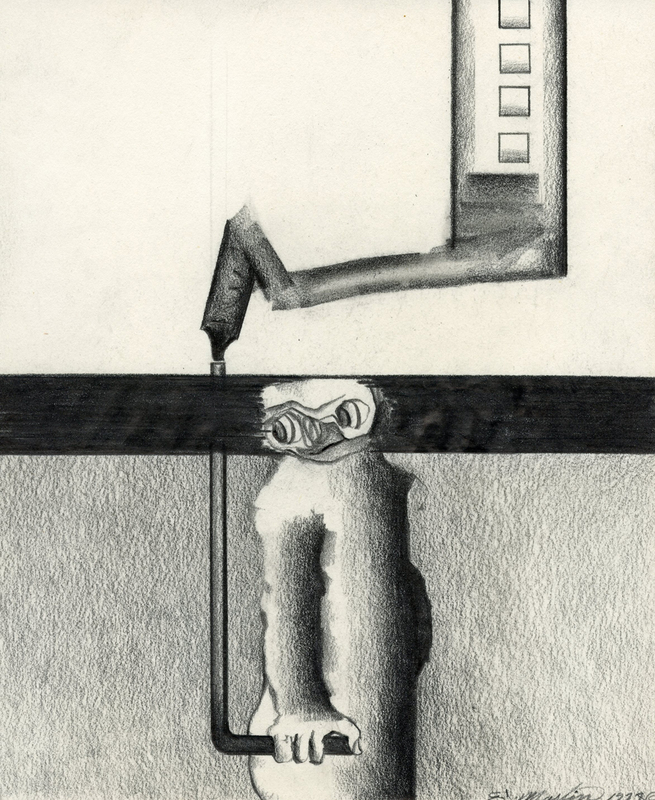 Untitled 1978 graphite drawing by Eugene Martin, 9 3/4x8"
2018. Want to Buy Art Without Breaking the Bank? Consider a Drawing by Scott Reyburn, New York Times, March 29, 2018. 2016. Ten Paintings for #BlackArtMatters, by Eugene J. Martin. Edited for Unlikely by Rosalyn Spencer, #BlackMatters Guest Editor. 2014. Beta Pictoris Gallery, Special Issue Basel, Installation Magazine, Sept. 16, 2014. 2014. Eugene James Martin's colors, cubism and collage: Exhibition opens Sept. 5 at beta pictoris gallery, by Michael Huebner, al.com, Aug. 27, 2014. 2014. Reproduction of artwork in daily Art Basel Edition, Blouin Artinfo.com, June 20-22, p. 11. At the Booth: A peak at satellite fair offerings. Eugene James Martin at beta pictoris gallery/Maus Contemporary. 2014. Mention in Heading North - The South, African American Art, and Civil Rights, by John Haber, haberarts.com, June. 2013. Mention in The Fireworks of Abstraction - Odili Donald and Mark Wiener, by John Haber, haberarts.com. 2013. Eugene J. Martin, Chelsea, New York City exhibit review by John Haber, Artillery Magazine, Vol. 8 (2), Nov/Dec issue. 2013. Long, hard road to recognition - The life and Art of Eugene J. Martin, International Review of African American art, webzine, September 2013. 2012. Mention in Projecting Bearden, The Shape of Things to Come, and The Mess he Made, by John Haber, haberarts.com.